Adam will be joined by Co-Founder Trevor Nelson in attending the 19th Annual Low Country Home and Garden Show in Savannah, GA this weekend, February 9th & 10th. The pair will be manning a Pure Solutions booth where visitors can learn and ask questions about all of our service offerings as well as learn exactly what sets us apart from our competitors. For more information visit the Savannah Home and Garden Show. The Garden Show is taking place less than a week after our beloved Patriots came away with their most recent Super Bowl Championship in Atlanta. 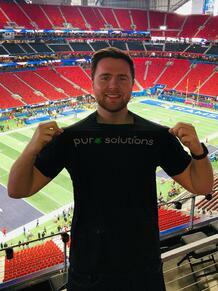 Our Sales and Marketing Analyst, Spencer, was fortunate enough to have been able to attend the thrilling event where he flaunted some of his Pure Solutions attire. Whether it is for service completion, community involvement, or simply for pleasure we are quickly falling in love with Georgia and everything it has to offer.